At BikeSD, we believe that we can learn a lot from the past and hopefully avoid the missteps made in the past. 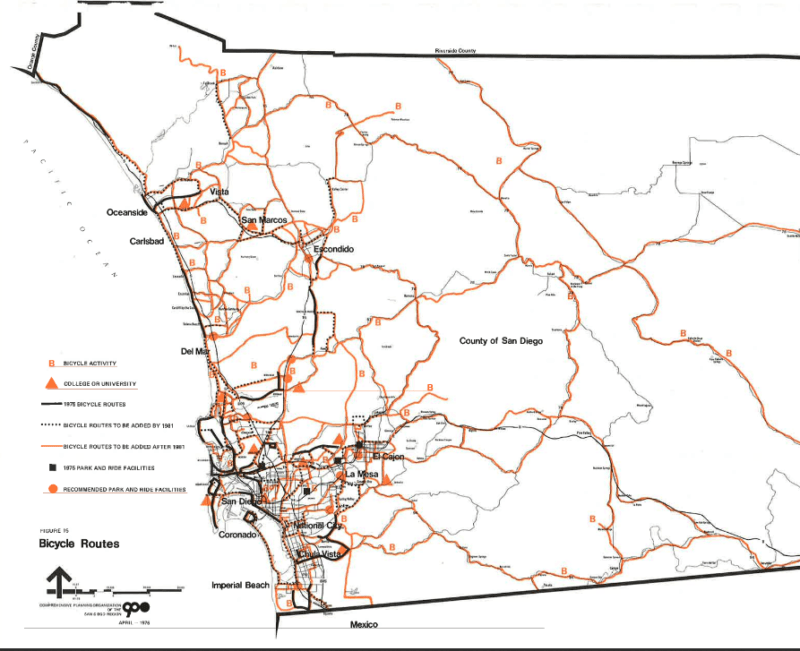 Thanks to SANDAG’s Public Information Office, we’ve gotten a hold of all the Regional Transportation Plans (RTPs) from 1975 onward. As SANDAG prepares to update their 2050 RTP, it is important to understand how we can we best influence this planning document so that the implementation results are not the same as it has been in the past. This post is part of a series to understand and document all the old RTPs. In order to understand how bike projects get funded, it is important to understand the process behind it so we can be that much more effective in our work. Between 1948 and today (66 years, or a single lifetime), the city of San Diego grew by a million residents. 1948 heralded the beginning of a new era in San Diego: the first freeway, Cabrillo Freeway (SR-163), was opened to the public. This 7-mile stretch through the heart of Balboa Park, San Diego’s “crown jewel”, was the dawn of the new era of freeway building that just wrecked havoc over the city’s established urban neighborhoods. From my reading, the city of San Diego simply deeded over their own property to highway engineers and Caltrans to build freeways through the city who then subsequently did just that – built freeways throughout our city. The agency that we now know as SANDAG, didn’t exist in 1948. However in 1966, leaders around San Diego county formed a voluntary association called the “Comprehensive Planning Organization”, or CPO, to “address long-range transportation and other regional planning issues.” As a short aside, today we have a similar effort at the city level via the Community Planning Groups that serve in an advisory capacity on planning issues related to the city to advise our elected councilmembers at City Hall. The informal voluntary structure of the CPO was formalized by the former Governor Ronald Reagan in 1970. This structure is, as it was then, called a Metropolitan Planning Organization and came about as a result of the Federal Highway Act of 1962. This “federal landmark legislation required the formation of Metropolitan Planning Organizations, and the development of a ‘3 C’ (continuous, coordinated and comprehensive) planing process as a condition for receiving federal funds in the Urban Areas“. 1970 was also a momentous year for another reason, California’s landmark environmental statute, CEQA (California Environmental Quality Act) was also passed by the same Governor Reagan. Roughly six years after the MPO structure was formalized by legislation, our local CPO released their first Regional Transportation Plan. This CPO changed their name to SANDAG in 1980. Reading the list of projects in the 1976 document is like reading a list of broken promises. For the biking element, the 1976 RTP called for the creation of three hundred and five (305) regional “bicycle route improvements”. 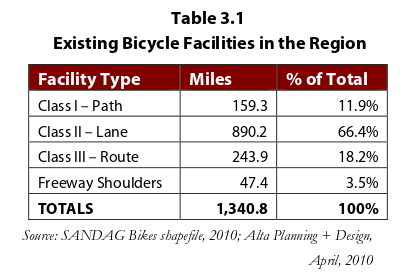 It goes on to state that “these improvements are primarily bike paths and lanes separated from automobile traffic.” There was no mention of putting cyclists onto freeway shoulders, like SANDAG proudly lists in their 2050 RTP as part of their existing bicycle facilities list. 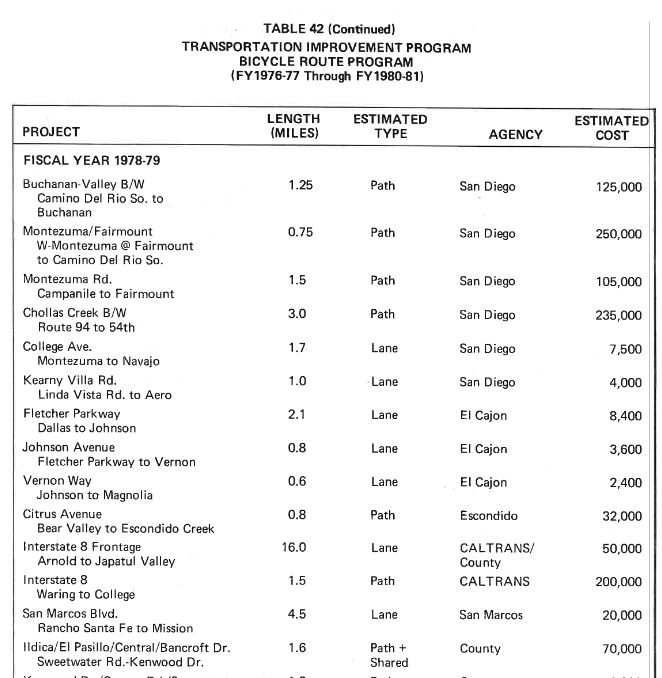 Since the passage and adoption of the first RTP, it seems like SANDAG randomnly implemented some projects, completely ignored and then eliminated other projects without justifying to the public the rationale for doing so. Like the 2050 RTP, the 1976 RTP also proudly states how much the public was involved in the creation of the document. It’s too bad that the public’s input, especially as it related to not building more freeways, was just pushed aside and ignored. Because today, we have a lot more freeways than just that one 7-mile stretch of freeway that divided Balboa Park into two over six decades ago. A more thorough writeup of the 1975 is forthcoming. This post erroneously stated that the first RTP was adopted in 1976, it was actually in 1975.